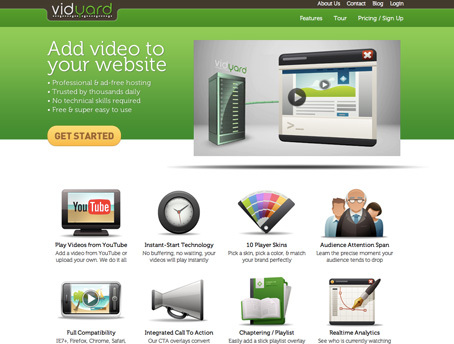 Vidyard, a company that bills themselves as a “YouTube for businesses” raised $1.65 million this week from Softech VC, Jawed Karim (Co-Founder of YouTube), Y Combinator, SV Angel, Andreessen Horowitz, iNovia Capital, Paul Buchheit, Vivi Nevo, Dennis Kavelman, David Nizkad and various other partners. Launched in August 2011 the company allows businesses owners to use videos as a marketing tool while eliminating the clickthrough to other video hosting services. For example rather than embedding a YouTube video onto a page and having users click on the video and be taken to the YouTube website, website owners can embed their videos into a customized player or even grab YouTube videos and place them inside a unique player with no click-through option. After videos are uploaded and embedded on a users website the program then provides various helpful tools including real-time analytics for each video with ad-free hosting and branded video players to fit your sites look and feel. Users can also implement instant start technology, create fully customizable calls to action and syndicate their content to Facebook, Twitter and even YouTube. Among the sites analytics are video views, engagement time, most popular videos and other several other helpful options. As an added bonus Vidyard uses RTMP streaming technology which means your sites visitors can jump to the middle of a video without waiting for that section to buffer first. With plans starting at just $34/month it’s easy to see the allure of this type of platform for video intensive businesses.